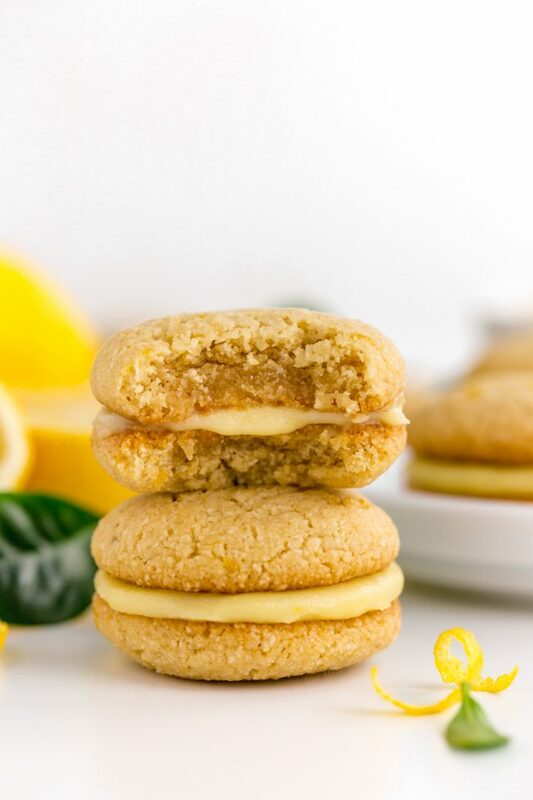 Lemon curd is sandwiched between soft and chewy paleo lemon cookies in this dairy-free treat! It’s been awfully dreary and rainy lately. During times like these, I’m all for lemon goodies. Some of my favorites are this Italian lemon almond flour cake (it has white chocolate in it but I’m working on a paleo version!) and these paleo lemon bars. Just a bite of either are enough to cheer me up. The lemon cookies in these cookie sandwiches are actually vegan, but because of the curd, the cookie sandwiches aren’t. I tried to come up with an alternative vegan filling but couldn’t make anything as delicious as the curd. Have any of you made any tasty vegan lemon curd? So the cookies on their own are already soft and the curd softens the cookies even more. It makes them totally irresistible. I used this honey sweetened lemon curd as the filling since I had to do something with it after making a huge batch and I don’t especially like it on bread. Or by the spoonful. 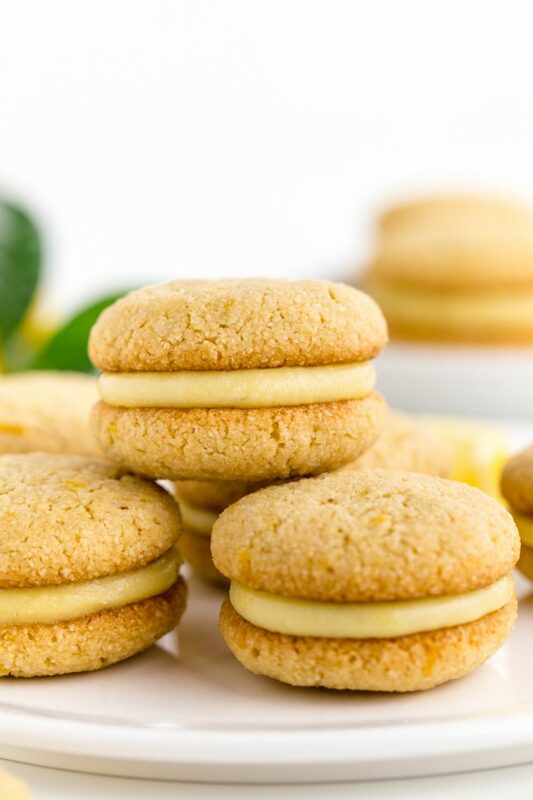 If you don’t have any curd handy and don’t want to make any, the cream cheese filling I used in my chewy ginger sandwich cookies with lemon filling would work well here but the lemon curd just adds so much zing! This recipe has lemon extract, lemon zest, and lemon curd. Switch all of that out to lime or orange if that sounds better! After writing that, I think I need to try a key lime version ASAP. So, just like usual, it’s been a long time since my last post. The babysitter I mentioned that would be starting the next day hasn’t started yet and probably won’t until the end of the month. She got sick on the day she was supposed to start. In a large bowl, mix together the coconut oil, maple syrup, lemon zest and lemon extract. Add the almond flour, sifted coconut flour, baking soda and salt. If the dough is too soft to roll into balls, refrigerate for 30 minutes or until firm. Line a baking sheet with a piece of parchment paper or a Silpat. Roll the dough into twenty-four 3/4" balls and place 1" apart on the prepared baking sheet. Press the balls down slightly and bake for 10 minutes. The cookies should crackle a little. Let the cookies cool for 5 minutes on the baking sheet and then remove to a wire rack to cool completely. Once the cookies are cool, assemble the cookie sandwiches by placing 2 teaspoons of curd between two cookies. Place the cookies in an airtight container and refrigerate for up to 5 days. Using unrefined coconut oil would yield cookies with some coconut flavor. If you want truly lemony cookies, you have to use refined coconut oil. 78 comments on “Paleo Chewy Lemon Cookie Sandwiches (grain-free, dairy-free)” — Add one! These cookies are everything I’m dreaming about this spring. I crave just about anything lemon flavored this spring. There’s a girl scout cookie with lemon creme I can’t have, since I’m gluten free, and i think these will be a great substitute! I’ve made several of your recipes but I’ve never left a comment. I couldn’t resist with these lemon cookies. They are PERFECT. I followed the recipe as written (but doubled it), made the curd (it was quick and easy) and though I am the only person with the wheat allergy…everyone LOVED these, including two very picky teens! The flavor of the light lemony cookie with the bright tangy curd is just enough to satisfy as a sweet without sugar overload. Thank you for sharing this recipe!!! You’re welcome! And thank you for leaving a review for these cookies. :) I’m so glad you think that they’re perfect! It’s great that even the non GF-eaters loved them. Thanks for your comment! Looks like a good snack idea! So craving these! These are perfect for spring time. Lemon cookies are great this time of year and I can’t wait to make these. So good! I’ve been obsessed over coconut milk fillings lately. I really need to try a cookie sandwich. Have never done it before! These look like my next treat, incredible! These look so light and sweet; the perfect treat for spring! I am looking forward to making these with my kids. They will love these! These look so yummy. And makes glad spring is almost here. Can’t wait to make these! I can’t do nut flour, do you have substitutes for that?? Cassava or jus a gluten free mix?? Cassava or a GF mix wouldn’t work. Unfortunately there’s no direct sub for nuts flours. :( Sorry about that! Lemon curd biscuits are one of my favourites. Did you know, you can find a dairy free lemon curd jar depending on where you’re living? I live in Switzerland. I answered this in response to your other comment in another post, but in case anyone else is wondering, here is a recipe for DF lemon curd. :) I hope that helps! How do I make the lemon curd? I didn’t include that recipe within this post but rather linked to it since I had just posted it a few days prior to posting this cookie recipe. :) Here you go: honey sweetened lemon curd. Thank you! Do you know if Honey can be substituted for maple syrup in this recipe? I just made these cookies, and they taste great! But they didn’t come out looking as pretty as yours. My dough was rather course and wet. I also didn’t take the time to roll them. Do you think that could be it? I would appreciate anyone’s input! I love lemon cookies! And your pictures are pretty! Hoping you get a lemon tree of your own some day! Just made these with cashew meal from Trader Joe’s. The mixture was rather liquidy so I added an extra TBL of coconut flour. I just spooned them on the parchment paper instead of rolling. They turned out awesome! A little flatter than pictured, but chewy in the middle with a crispy edge. Will definitely make again! 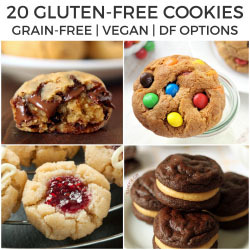 I love lemon cookies – and i have never tried grain free! These are a must! Yummy, Erin! With lemon curd, too!! I love that these are grain free. Can’t wait to try them! Thanks, Becca! And what?! You don’t bake with citrus in the winter? I thought it was a wintry thing! I made this recipe last weekend and my kids LOVED it. The plateful was gone within half an hour! It was easy to make and definitely worth repeating. I used honey instead of maple syrup because I was out, and my batch took about 15 minutes in the oven instead of 10. The cookies were not quite sweet enough for my kids to eat plain, and I didn’t feel like making the lemon curd, so I made a very simple lemon icing (shortening, powdered sugar, and lemon juice.) Fabulous! I took a picture but I don’t see a way to post it here. Next time, I am going to try using ginger instead of lemon flavoring and see if the basic recipe will also make a good ginger cookie. LOVE these lemon cookies, Erin! I agree…fresh citrus following Christmas is essential after all the chocolate, caramel and coconut indulgences. Cannot wait to whip up a batch! Thanks for sharing, girl. Now following you via Bloglovin’. :) Pinning! 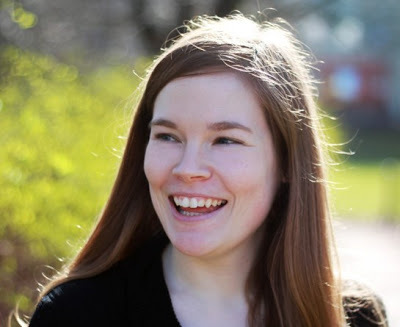 So happy to have you following on Bloglovin’! And how sad is it that I just started looking into feed readers? I really liked Google Reader. ;) Thanks for following and pinning! Thank you! And agreed. Don’t give me ginger or anything with cloves or chocolate. I want LEMONS! :D I hope you’re having a great week, too! I would love anything lemon right now. I just truly love that flavor. I see that you have made quite a few goodies that I would like to try as well. I have never made lemon curd before. I am sure homemade is way better than store bought. Great looking cookies!! Thanks, Miryam! :) And yeah. Homemade lemon curd is much better! LOVE this Erin. Pinned and bookmarked. Well these are just the most perfect lemony cookies I have ever seen! Yum Yum! Lemon cookies are just what I need right now to get me through these dreary, rainy winter days!! They look so good and fresh. Agreed! I just can’t deal with this terrible greyness without lemons. 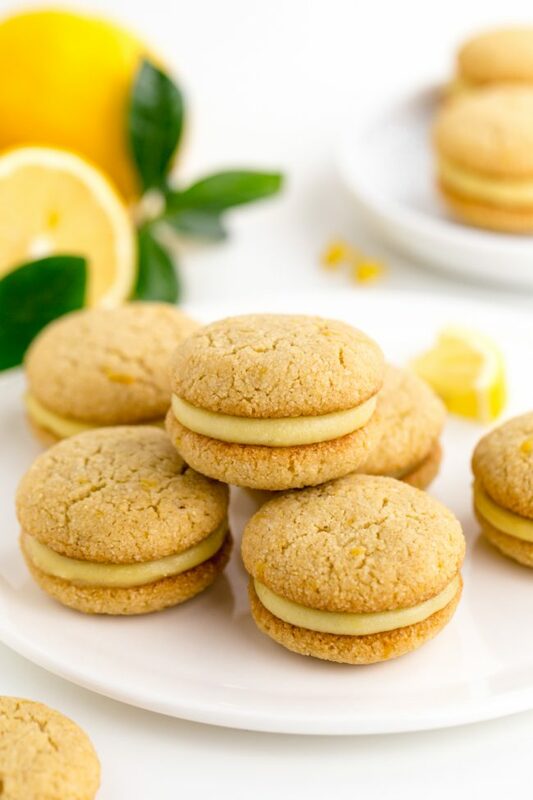 Love lemon desserts and your lemon cookie sandwiches look too good not to try! These sandwich cookies look soooo good, Erin! I love citrusy treats. I’ve often dreamed of owning a house with lemon trees, too! 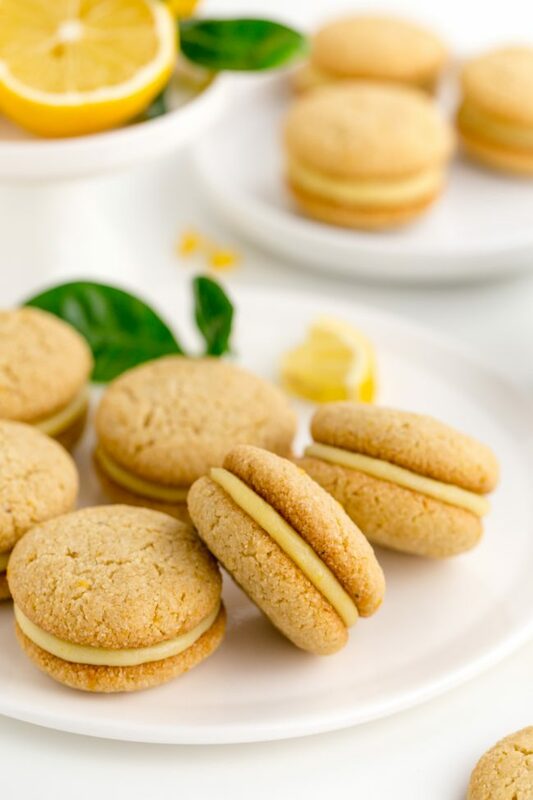 I love sandwich cookies, and lemon curd sounds like a perfect filling, I need to try these! Love the idea of these chewy little bites of sunshine!